I have a chance to express my long-held belief that there is indeed something truly different about the 21st century from the past, that we've entered one of those markers in the history of civilization we now see in retrospect as a true "discontinuity" - the "inventions" of language, writing, printing, the modern "academy," the scientific method, the Renaissance, and the Industrial Age. And so, with a cohort of thinkers, I'll be contributing to a book to be edited by Heidi Hayes Jacobs and published, hopefully later this year, by ASCD. The working title of my contribution is "Five Socio-Technology Trends That Change Everything in Teaching &amp; Learning." My thesis is based on the idea that new technologies and the social behaviors they stimulate are literally rewiring our ability to learn in new ways, and that "curriculum" in the 21st century must respond by shedding its industrial age markings (left brain linear proclivities) in favor of creative, critical thinking models that are sustainable in an age of knowledge abundance. I will officially be leaving my position as Program Director for the Center for 21st Century Skills on June 30th, the end of our program year. I am sincerely grateful for the experience of the past four years as a co-founder and leader of this organization, which has seen dramatic growth and provided so many wonderful opportunities to students from our urban, suburban and rural communities in Connecticut. The team is now populated with passionate and talented people and, as a result of our NSF funding, positioned for long term growth and stability. I'm confident that the team of people now leading the Center will continue the good work of developing highly innovative curriculum and project-based experiences that will help prepare secondary school students for the kinds of skills needed to succeed in a dynamic, information-based, knowledge-oriented global community. For me personally, it has been a rewarding highlight to see so many of our program graduates go on to do such wonderful work at universities and in communities across this country. I'm particularly proud of the kinds of "community service" commitments I've seen blossom from the work our students have engaged in. This year, for example, in coming up with a solution to an economic and entrepreneurship challenge, our winning team, an urban class of 20 students from a school in Hartford (one of our state's most embarrassingly under-performing districts) based its e-business model on a non-profit plan to feed, cloth and secure the victims of the Darfur tragedy. The solution took on it's shape and emphasis, in part, as a result of a trip I arranged, in cooperation with a courageous and determined school principal supported by a strong community of teachers and parents, for 18 of these students to go to China for 2 weeks, including a cultural immersion in a remote western region of China populated by multi-ethnic and religiously diverse peoples. For these students, the trip in March was life-changing and brought a real sense of urgency and passion to their project work. These students heard, first hand, from students in China how Chinese students share the same concerns about the global economic and humanitarian conflicts arising out of "national energy" needs and policies, and the collateral consequences of such powerful interests as evidenced in Darfur. It was a truly remarkable experience to sit amongst these groups from opposite sides of the world and life experience, and hear their intelligent and reasoned discussions, and then to see them put their new-found knowledge to work in such a passionately humanitarian way. Judges at this year's Exposition of student work from over 40 school districts in Connecticut were clearly blown away by the work of many of our teams and their focus on "community development" as solutions in a challenging world. My new directions are exciting and humbling at the same time. I'm going to effectively be operating as a free agent out of a need for some time to write and work outside the scope of any formal programs. First on the agenda for the coming years is my opportunity to live and teach in China, as a guest of the Board of Education and the Foreign Affairs Office of Ningxia Hui Autonomous Region in the Peoples Republic of China. My home, for at least 6 months out of the year, will be a faculty apartment on the campus of Ningxia Polytechnic University in the city of Yinchuan. I will help with curriculum design and projects aimed at universities (Ningxia Polytechnic University, Ningxia University, Ningxia Medical College, and Ningxia Teachers College - all national universities in the Chinese educational system) and middle schools (the equivalent of our high schools) throughout the province of Ningxia. I will guest lecture on the kinds of skills needed - collaboration, communication, team-building, project management, creativity, critical thinking, cultural and social diversity, and global awareness - to be a fully responsible participant in a global knowledge economy. Part of this mission is to work with friends and networks in both China and the US to stimulate cultural, learning and teaching exchanges. Certainly the opportunity for teachers and students in both China and the US to travel to each other's country and gain first hand experiences that represent meaningful lessons in cultural identity, appreciation, and respect are part and parcel of this plan. But I've come to believe that the great historical and philosophical underpinnings that make China and America such uniquely iconoclastic societies deserves much more than a journey of any length and time period. There is so much more to be shared and understood. So using my experience with project-based learning activities supported by the increasingly accessible technologies that make the world a more reachable community in all its corners, nooks and crannies, I am working to prepare a framework for student/learner collaboration that will allow a multi-disciplinary experience, building lasting relationships, and hopefully creating a deeper, richer understanding and global awareness among all learners. In this context and as a beginning, there are two websites designed to support these goals through networked collaborations of students and institutions. Ningxia Dragon Student Ambassadors is designed to bring students together through active exchange programs, including traditional stand-alone exchanges, and through active blended learning programs and projects. Another site - New School Curriculum Group - provides a portal for a set of collaborative partnerships and programs to prepare students for significant cross-cultural learning exchanges. I am indeed fortunate to have critical relationships (guanxi) in China in government, education, and business networks that have offered me an opportunity to do some development in an area of both special interest and high sensitivity to both cultures. I'm learning first hand the range of opportunities and risks of a system - China in the 21st century - undergoing incredible change. So, with a commitment of support for my work in China for at least two years, I will be traveling and splitting my time (roughly six months in each hemisphere) between China and the US. What I regret not having done with my life-choices at the age of 20-something, I now get to do at the ripe old age of 60. I am indeed fortunate. Second on the agenda is to do some writing. I have a contract to contribute to a compilation of curriculum ideas in "A New Essential Curriculum for 21st Century Learners," to be edited by Heidi Hayes Jacobs and published by ASCD by the end of this year. I'm also going to be working on some other book projects, notably a project in collaboration with Dr. Subhash Jain at the UConn School of Business on the state of leadership development at the dawn of a revolutionary transformative period in history where technologies have taken on a trajectory and convergence at a pace well ahead of our social and political institutions' ability to respond to the great questions - moral, ethical, cultural, social - posed to the next generation of leaders. I was pleasantly surprised recently to receive an invitation to join the Academy for Global Economic Advancement at the UConn School of Business, which will give me an opportunity to contribute to research on curriculum practices in management and leadership education, to speak at quarterly conferences of the Center for International Business Education and Research, and to write on topics of global business and economic leadership issues. As a friend and visiting fellow at the Information Society Project at Yale Law School, a card-carrying member of the Action Coalition for Media Education, and a participant at the Center for Future Civic Media at MIT, I have an opportunity to draw from the expertise and dialogues of organizations at the nexus of next-generation questions about global social, economic, and political leadership. In June, I'll be attending conferences at Princeton and in Upstate New York. In July, I return to China for the month, including chaperoning a grop of 20 students and teachers on an exchange trip to Ningxia, Mongolia, and Sichuan where we will "adopt" a school damaged in the recent tragic earthquake, so that the students can return home to build a community of solidarity and support for the rebuilding and healing process now underway. I'm planning on attending the DNC in Denver. I played a lead role here in our Connecticut grassroots organization for Barack Obama. However, fitting the Convention into my schedule may be more challenging than I can manage. All of this activity creates a sense of wonder at how life's twists and turns are both unknowable in advance but humbling in the opportunities all of us have to contribute positively to our families, communities, and fellow travelers. I hope to hear from and share more with my friends and colleagues, all of whom I depend on for the mutual trust and shared reputations for good works and caring spirits. Many educators are beginning to hear about the potential for 3D learning environments. Perhaps the best known emerging platform is SecondLife. For all it's promise and interest, early adopters of the SecondLife platform find many problems and difficulties as a "ready for prime time" platform. Part of the problem relates to the question of openness. Linden Labs, developers of SecondLife, has been struggling with the inevitable challenge of moving towards a more open framework in order to encourage a broad development community, while maintaining their early advantage of a "for-profit" business model. To familiarize yourself with SecondLife, particularly in education, check out their wiki site. Also, Check out NMC, a leading consortium of educators who are experimenting with virtual worlds and simulation in education. Finally, Sun Microsytems' DarkStar project shows some real promise towards overcoming the practical problems of "bandwidth" and processing power that currently makes working with virtual world environments klugey in classroom settings. Sun's design creates a peer-to-peer network of user computers that overcomes the processing limitations of a server-client network in much the same way as bittorrent does for large video downloads and streaming. The MPK20 Sun Virtual Workplace demo, while graphically uninteresting as an early version of the technology, nonetheless shows some of the promise of 3D virtual worlds in education. Production costs have gone to “0” in the digital age. Learners are now producers of content; not simply consumers of content. Social networks enable affinity groups that build learning. Web 3.0 tools are emerging that make the Internet a powerful repository of knowledge. Examples: Photosynth and ”friend of a friend” (FOAF) applications. New technologies make virtual world processing inexpensive and practical. 3D simulations and virtual worlds have the potential to permanently alter our sense of time and space in learning environments. Biology opens new windows on the world of information and knowledge creation. Decoding the human genome is a significant development in our understanding of knowledge. The rate of new knowledge is on pace to grow at unheard of exponential rates. Between the years 2001 and 2004, I taught psychology, economics, and history at Cheshire Academy. Those days now seem far away right given all the work and progress I've experienced at the Center for 21st Century Skills. But Cheshire Academy was my most rewarding teaching experience, allowing me to really branch out and learn about learning at warp speed. The students, colleagues, and community at Cheshire Academy were really like a family for 3 full years - with all the exultations and tribulations that families bring. That's why this week has been so tough. Over the past couple of years, tragedy has tinged the memories. Glenn Edwards tragically took his own life as the result of the pain and humiliation of a charge of sexual misconduct with a minor. Regardless of how one feels about an openly gay man living and teaching in a boarding school community, Glenn was immensely popular with, and caring towards the vast majority of students he interacted with. What happened to Glenn could happen to anyone of any sexual orientation, whose urges are not rigorously self-controlled in an arena of close proximity and relationship with students far from home and family. This may sound like a no-brainer, but many of these students come to view their "local parents" with the same emotions and intimacy that occurs in any close knit family setting. And so the line of "appropriate behavior" is always being tested. The news on Monday morning of this week was surreal. A gruesome triple homicide in the town of Cheshire... what was the family name? Oh my dear God! It can't be... Jenn Petit? Her 2 daughters? Her husband beaten to within an inch of his life? How could this be? Jenn Petit was a stalwart of my Cheshire Academy family experience. Beautiful, intelligent, professional... all of this and so, so much more. She had the completely rare and uncanny ability to do what some can never do - approach that very fine and undefinable line between keeping a "professional" distance and getting so personal with the students under her care, that never once in my experience would a child ever have any reason to feel anything but completely safe in Jenn's care. Jenn was perfect in the roll of student health provider and teacher. Her death this week is a tragedy for the world. Her death, and its gruesome manner tests our faith - in goodness, in charity, in kindness, and in doing for others. And so, it's hard to find any silver linings in this week of sorrow and broken hearts. One of Cheshire Academy's 2002 graduates, a Japanese student known to all as Masa, compiled a piece that I think reflects well on the Cheshire Academy family. I offer it here in tribute to Jenn Petit and her family. God bless them all. To fully understand and grasp the implications of the current "China phenomenon," I recommend reading the James Fallows article (actually, the first in a series) in the current issue of the Atlantic Monthly magazine. If you're not a subscriber to the Atlantic Monthly, I've saved a copy of the article in PDF format here. Also, there's an interesting multi-media version of the story. Click on the image. In my mind, there is little doubt that we are at the initial stages of tremendous change to our educational structures. The way in which we interact with knowledge - co-creation, commenting, amateur peer-evaluation, openness, etc. - is strongly at odds with traditional education. Classrooms have been conceived as comprising a single prominent node (the teacher). Yet, our daily interactions are multi-nodal. Our experience with information is multi-perspective. Forecasting the world in which our children will be working and living long after we are gone is an impossible task. We can not, with certainty and absolute confidence, even forecast what the world will look like in the next 10 years. School systems all over the world, literally everywhere - in so-called developed and undeveloped places - are set up to make academic professors of us all. Middle and secondary schools are set up to physically and academically resemble colleges -- curriculum is built around fifty minute chunks; academic seat-time is measured in quarters or semesters; grades are used to mark mastery, content is delivered only to be absorbed and repeated, etc. 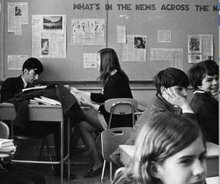 The trouble is, no matter how revolutionary secondary curriculum and participation is, if one stays on track a student will run smack into the walls of the ivory tower and will be transported back to a medieval system where the ultimate goal is to fill our brains -- slightly on one side, of course -- with content. How many of us were told as children not to dance because we won't grow up to be dancers; not to paint because we won't grow up to be painters; and so forth and so on. Sir Kenneth Robinson explains how schools kill creativity far more eloquently than I can. The question that remains for me is whether education can evolve on it's own...or whether it will be transformed and revolutionized by outside forces. Here's a point of view I hold: Strictly in the context of the Internet age (and the promise of 21st century participatory cultures), our educational system is fatally flawed. (I'm really talking about the system that is in place from roughly the 4th grade through 12th grade.) Question: Can the "system" be fixed or is it doomed? I believe our current K-12 system of education is doomed. I believe that, in the absence of the rise of a replacement system, the great "divides," starting with the digital and ending with the income, quality of life, and "creative" class, will be greatly exacerbated until society is heavily destabilized, risking the outcome of a ferocious 21st century version of fascism. The countervailing response to such an outcome requires an economic theory based on abundance (The Wealth of Networks), not scarcity. I believe that all human knowledge is rapidly aggregating on the Internet. This makes access to "the world's knowledge" and the means of social production an educational right, indeed a fundamental human right - available to every culture and individual, regardless of socio-economic status. Weighing the risks and opportunities should demonstrate that whatever perceived "risks" to learners (again, I'm speaking primarily about learners in the 10-18 age bracket), opportunities for self-determined learning through unfettered access to the Internet are far greater and more essential to human health, economic, and social progress. The "free market" system is not to be trusted as an intermediary in this area. Our "free market" intermediaries remain bounded by fear and the threat of the shift of large segments of the population away from being manipulated "consumers" toward independent "producers." The work I've been doing with students raises the following hypothesis: Access to the Internet is a human right, on par with the rights bestowed by the great Civil Rights Act and the rejection by civilized individuals of apartheid practices everywhere. Access should not be filtered or qualified, indeed it cannot be filtered and qualified by gatekeepers of a failed educational system. Removing all barriers to accessing knowledge and the means of social production in our educational system is the signal challenge of the next 5 years.